Viva Nash, 93, is the oldest prisoner on Death Row in America. 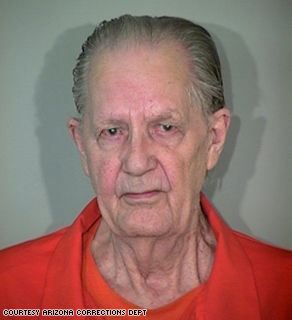 Viva Nash has the dubious distinction of being the oldest prisoner on Death Row in America. The double murderer is 93. He has spent virtually his entire adult life behind bars. But is he too old to be executed? Many believe he deserves to die for the brutal crime he committed on November 3, 1982. On that day, Nash walked into a coin shop in Arizona and demanded money. The employees had no idea the armed robber was a fugitive from justice. Three weeks before, Nash had escaped from a Utah prison where he was serving a life sentence for murder. At the coin shop, Nash pointed a .357 Colt Trooper at Greggory West and fired three rounds into the clerk, killing him. He was arrested a short time later. He was tried, convicted, and on June 27, 1983, sentenced to death. 26-years later, Nash remains confined in a single-man cell. He is one of 116 men confined to Death Row in the Browning Unit at the Eyman Arizona state prison complex. Nash, who was born in 1915, is treated like other condemned prisoners. He has no contact with visitors or other prisoners, is allowed two brief telephone calls a week, and , except for 2-hours of outdoor exercise, is locked up 22-hours a day inside an 86 square foot cell. No execution date has been set for Nash. But should one? And should it be legal to put an elderly inmate to death? "The Supreme Court has said that juvenile offenders can't be executed. The Justices have never addressed whether one can be too old to be executed. The only check here, really, is political – does a governor want to authorize the execution of someone who is so old?" I think we are executing him ,everyday, in a long and slow ,painful death.Some would consider being locked up 22 hour/day "cruel and unusual punishment". Death would be a relief! He was a senior citizen when he committed the DP worthy crime. Most of us would want to be put down but this guy is a psychopath and normally psychopaths fear death so I say put him down. Again, this society makes decisions on what is perceived- "cute" youngsters, "pretty" models, "sweet" old ladies, ad nauseum. This black soul KILLED people for materialistic reasons. To assume that, after living 27 more years than the man he killed in Utah, Mr. Nash is now a "lonely old man" is movie-of-the-week nonsense. He KILLED people. He should never, ever, have been allowed to live this long. What's the cost to tax payers per inmate, per year, 30K-50K? Not to mention the hundreds of thousands of dollars spent over the 20 plus years joke of an appeal process. He's a convicted murder condemed to death! He showed no remorse when killing his victims, why should we? Put him in the dirt and let the courts argue the merrit of execution for another 20 years. Why shouldn't he receive the same punishment as any other death row inmate? His age should not make a difference on what his sentence was. I don't understand why we are always fighting to save the criminals instead of fighting for the victims. He didn't care about him victims or their families. He's had the chance to make it to 93 and I'm sure the mother's or children of the victims would give anything for their loved one to have the chance to turn 93. He should sit there and die in prison a lonely old man. Give him the needle! Why should we continue wasting tax payers dollars keep him alive so he can rot away for a few more years. There's really no point! An eye for an eye, that's the way it should be. You commit murder, especially if you do it more than once, you don't deserve to live with the rest of us in normal society. It's time to clean house! This is the problem in our country! When murderers are given the death penalty it should be carried out in a timely manner not 26 years later no matter how old they were when they chose to murder someone! There is no excuse for murder, there is no reason not to murder the murderer, but at the age he is now just let nature take its course and let him die just as he has lived for 26 years. He proved himself worthless as a human when he decided to murder!! I'm only a kid, and I think that the old guy has it bad already, and that it would be very unfaith like to put him out of his misery no matter how many people he has killed. How do we have the right to put anyone to death? Its too sad that love brings us into the world, just to have hate take us out.